Applying the same system that resulted in victory in 2018, I expect to finish last this year. OK, slight problem now Goff has replaced Bushell. Will we need to redo our predictions or will where we put Bushell just be Goff now? 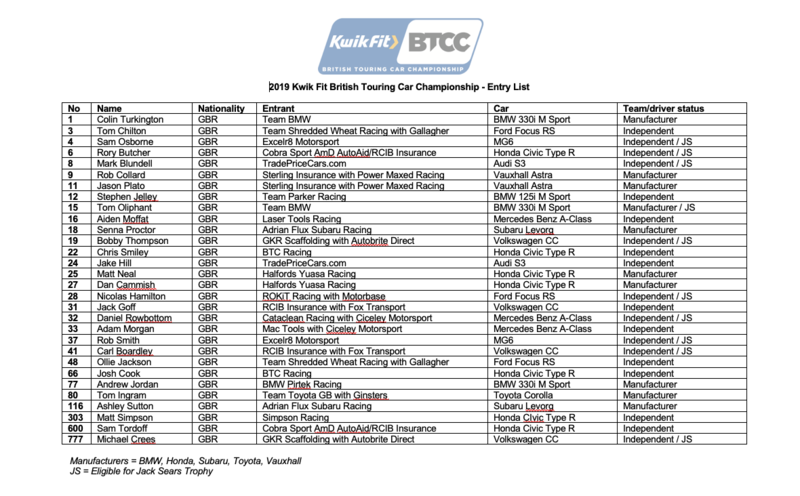 13) Picks can only be entered, changed, updated or amended up until 00:00 BST Saturday 6th April 2019. Late entries will not be permitted. Bushell will not count as a correct pick. Can't we just stick Goff where Bushell was or do we have to repost the whole list again? Do whatever you feel like. I won't be putting the info into the spreadsheet until the deadline closes, so make as many edits/posts/changes as you want. Sorry, bad wording - do we have to repost our whole list just to swap Goff with Bushell? Would it not be easier for you to change it on the spreadsheet when writing them in rather than a dozen reposted lists with one change? Sorry, I'm a bit confused by this. 30 drivers, 30 picks. So everyone to date has picked Bushell. Are you saying that we all have to submit a new/amended entry, detailing that we have all swapped Bushell for Goff (the only possible option at the moment)? Or that anyone who picks Bushell now will not have it as a correct pick? Will you be advising entrants (as happens with the Fantasy F1) that they need to amend their entry? Or to save everyone the hassle (and eliminate the amount of posts you have to review), will you replace all Bushell slots with Goff? You can post an entirely new set of picks if you want and you can change your picks as many times as you like, just as long as it's before the deadline. I will accept a quoted post stating a wish to switch Bushell with Goff if that's all you want to do. Now that the official entry list has been published (here), I'll say that these drivers are the only ones that can be picked. Any other name on a list of picks will be deemed incorrect and will incur a maximum score for that particular race. The number of posts in the thread won't be an issue for me, I'll just work my way from bottom to top. I'm coming for you Greem. Hopefully this year's randomness is better. I will accept a quoted post stating a wish to switch Bushell with Goff if that's all you want to do. I wish to switch Bushell with Goff.